12 Creative Takes on The Classic S’More! Every week we pull together some great Canadian recipes from food bloggers around the web featuring one main ingredient or dish. 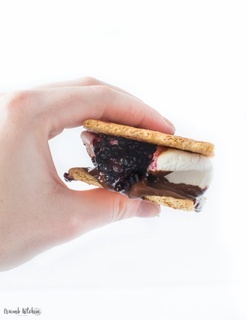 This week we get creative with the campfire classic, the S'More! S'Mores are a campfire classic. Three simple ingredients are all you: graham crackers, marshmallows and chocolate. But what happens when you take those three simple ingredients and get a little creative? How about 12 unique s'mores recipes that will keep this summer camping tradition alive all year round? **[Chocolate Blackberry S'Mores](http://crumbkitchen.com/dark-chocolate-blackberry-smores/)** from **Crumb Kitchen**. **[S'More Tart](http://withinthekitchen.blogspot.ca/2016/04/smore-tarts-grown-up-treat.html)** from **Within The Kitchen**. **[S'More Mars Bars](http://www.melissahartfiel.com/2011/06/20/smore-mars-bars/)** from** Eyes Bigger Than My Stomach**. **[S'Mores Pie](http://www.bakeforgranted.com/smores-pie/)** from **Bake For Granted**. **[S'More Cookie Cups](http://livforcake.com/2016/07/smores-cookie-cups.html)** from **Liv For Cake**. **[Spicy Ginger S'Mores](http://sweetrevelations.net/2016/05/29/spicy-ginger-smores/)** from **Sweet Revelations**. **[Fudgey S'Mores](https://emmaeats.com/2011/11/10/flee-fly-mosquito/)** from **Emma Eats...And Katie Too**. **[S'Mores Bars](http://www.foodmamma.com/2016/06/smores-bars.html)** from **Food Mamma**. **S'More Baked Oatmeal** from** Jo & Sue**. **[S'Mores Cheesecake](http://thecookiewriter.com/smores-cheesecake-6-inch-pan/)** from **The Cookie Writer**. **[S'Mores Popcorn Munch](http://leelalicious.com/smores-popcorn-munch/)** from **Leelalicious**. A big thank you to all our FBC Members who participated in this weekend's S'Mores recipe roundup.